These condensed size boxes are ideal for crash cart supplies yet versatile enough to be used for procedure kits, emergency kits, insulin storage, high alert med storage, and more. Three boxes side by side are the equivalent of a full size crash cart box! Instead of opening one full size box where all supplies are accessible use the one third size to provide control and limit access to all. Built-in handle allows boxes to be accessed easily in cart or carried to and from supply areas or alternate care sites. Boxes are available in colour for coding by department, medication, age group, supplies, floors, units, etc. Keep life saving supplies standardised and organised for quick and easy identification and access to medication. Amber or Clear slide-in lids are available with the boxes or individually. Lids can be ordered separately from the box, which allows you to make the conversion to amber lids at a minimal expense. Holes on boxes allow security seals to be used for control and documentation. 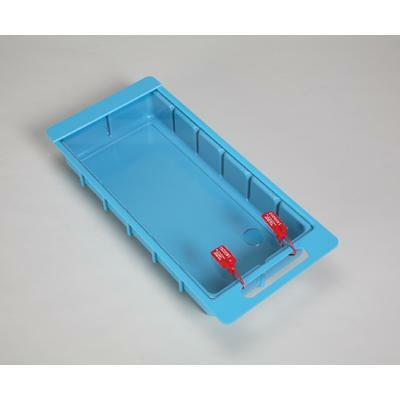 Dividers provide greater organisation and accessibility of supplies. Sold separately. Adaptable – these crash cart boxes fit most crash carts. Available in Blue, Green, Light Blue, Red, White, and Yellow. Specify colour when ordering.